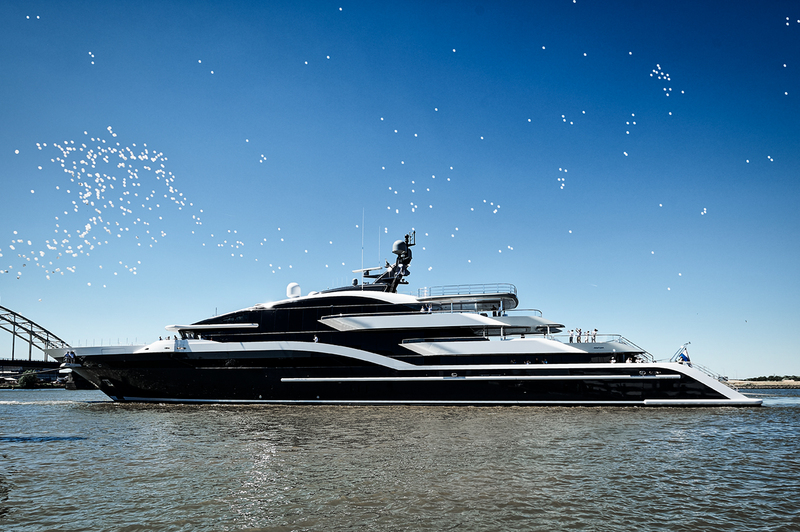 Oceanco’s new 90-metre motor yacht, known as Y717 and dubbed Project Shark for her distinct resemblance to a hammerhead shark, has been delivered to her owner. Project Shark features a contemporary exterior styling by DeBasto Design and a sophisticated interior design by Nuvolari Lenard. Her ground-breaking design and technological advances bear the unmistakable DNA of an Oceanco: she reflects the latest advances in glass technology and she is the first yacht in the Netherlands to be given the official Lloyd’s Register Integrated Bridge System (IBS) notation and designation. Y717 features a superstructure completely finished in reflective glass. From the interior, the glass yields panoramic floor-to-ceiling views aft, port and starboard. Her design was conceived to maximize opportunities for outdoor living and to have direct contact with the marine environment. While the yacht yields a massive amount of volume, DeBasto has ensured that the profile remains long, sporty and lean without a top- heavy superstructure that characterizes so many very large superyachts. The entire upper deck is dedicated to owners and as such has been specifically designed without walkaround passages to ensure complete privacy. Alternatively, the owners have access to the outside via private balconies, which flood the interior space with light and offer incredible views. The owners also have access to their own private forward- facing Jacuzzi. The interior was designed in concert with the exterior concept. According to Nuvolari Lenard, the owners stipulated no dark timbers preferring the delicate and sophisticated use of alternative materials and finishes such as fine fabrics, wallpaper, 3D lacquer and lots of upholstery. The interior woods include different shades of sycamore fiddleback, small details in tinted Brazilian carballo wood, and the copious use of maple bleached gray. Other accents include bas-reliefs; metallic surfaces and 3D cut leather panels.